The community is invited to the Elementary School Design Workshop Tuesday, March 20 and Wednesday, March 21. Stop by the elementary library at 611 Cothern Street anytime from 9 am – 7:30 pm either day. 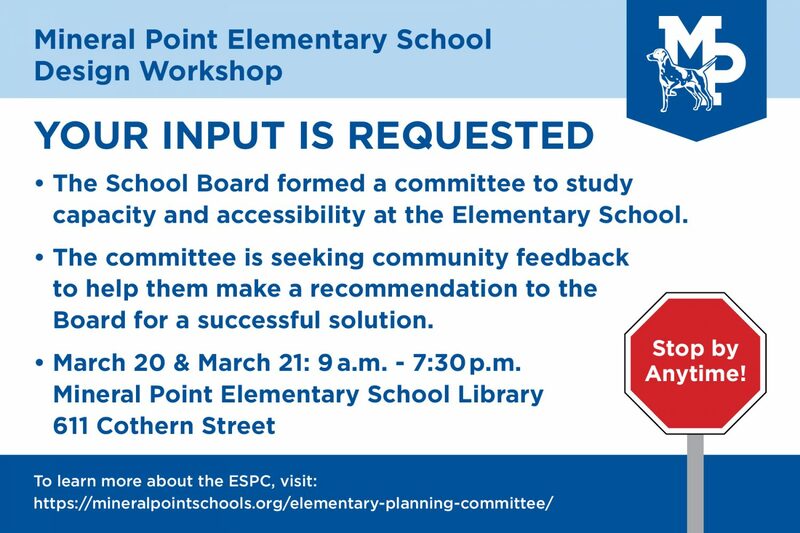 The School Board formed a committee to study capacity and accessibility at the Elementary School, and the committee is seeking community feedback to help them make a recommendation to the Board for a successful solution. The public is invited to suggest ideas, provide design input, tour the schools, and listen to presentations by the architects from FEH Design. The school district has assessed the condition of the facilities and has identified space needs. The design options that will be created during this workshop with your input are to help our school district find solutions for its needs.